The picture was painted in the period from 1883 to 1888 in oil on canvas. 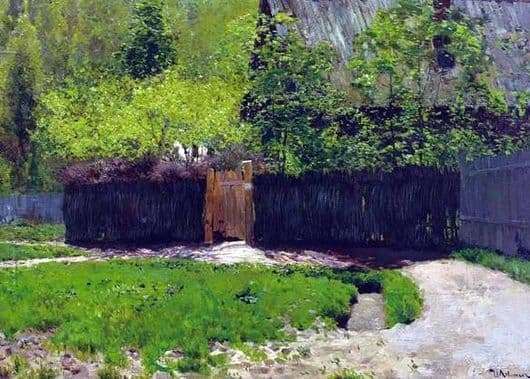 Landscapes Levitan – this is deep, filled with color paintings. Only he has the ability to combine the contrasts of dark and light shades. Cloth “First greens. May “shows us this. The artist uses only a few basic colors, but the riot of colors can not but amaze. I want to endlessly peer into the landscape. He calms and gives spiritual contemplation. Makes stop and think, pay attention to such beautiful and simple things that surround us. This is nature in all its manifestations. The picture shows trees that spread their leaves in lush crowns, among them the roof of an old wooden house in the background is almost imperceptible. The ability of the artist to betray the movement of sun glare is amazing. The house seemed to have grown into the ground along with the trees and was lost among this beauty. The artist with the help of the play of light and shadow gave the picture of life energy and realism. The gray shade of the roof harmonizes with the greens. All pictures of Levitan evoke unforgettable emotions in the soul. Looking at this landscape, as if you find yourself in front of this gate, on the path. Levitan had a special unity with nature. The artist left us a great legacy, which makes us stop and think, feel all the power and beauty of the Russian land. The picture is in the State Tretyakov Gallery. Moscow.